Yi Ch'ang-ho - Rin Kaiho (3rd Tong Yang Securities Cup, Game Five, 27 January 1992, see both Invasion and Reduction?, volume 2. and Tournament Go 1992 page 239.) Yi has just played the invasion at , and naturally, Black (Rin) pincers the invading stone at . Yi now plays the off-beat move , a tesuji. What happens if White plays "the usual move", invading at a, instead? What happens if Black answers by blocking at b? 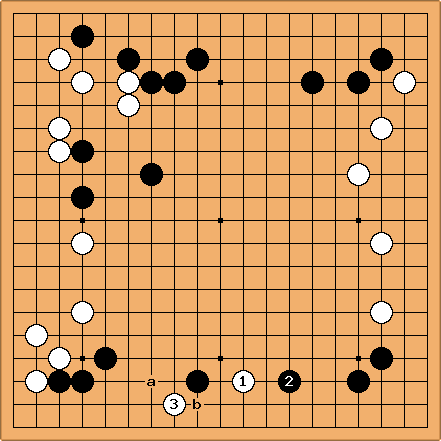 How should Black answer , and what will the continuation be?